...and get attacked by an octopus. Looks like Elliot should avoid any encounters with sixgill sharks considering she's hors d'oeuvre size! Before heading out to our evening plans we checked into our lovely inn. Ok...it was not exactly five star, but it was nice and the location was awesome. Elliot was definitely digging her first motel experience! Our rest over, we walked about one block away to the Seattle City Center. Melissa remembered the fountain and lawns from her childhood rompings. 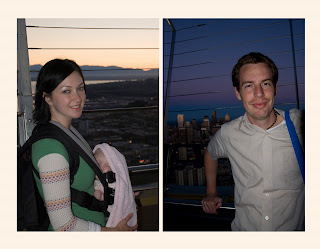 We actually paid the oodles of money you end up spending to eat at the Seattle Space Needle. Even though it is extravagent, we highly reccommend this place! You eat delicious food while the restaurant rotates 360 degrees as you eat! The view was spectacular. We just had to order the entertaining dessert we had seen other patrons receiving. It was called the "Lunar Orbitz," and while it was only a couple of scoops of ice cream, Elliot could not stop staring at the dry ice effects they throw in. Such dissapointment though when the fun stops! From the restaurant we were able to check out the observation deck and take pictures of the views we'd been oogling at. Once the breeze got too chilly at the top, we headed home for the night! Melissa wanted to check out another one of her childhood memories, the Pacific Science Center! First stop, the Cretaceous period. Very ferocious! A few exhibits later we decided to skip to the one we really wanted to see: the butterfly terrarium! There were all sorts of gorgeous bugs, and many stayed still enough that even Elliot could appreciate their beauty! For the next little while we checked out insects that we were glad were dead and behind glass. To end our science center experience we watched a lazer show set to the music of Queen. While we thought it was pretty funny and entertaining, Elliot went to sleep. Just for Elliot we checked out Elliot's Oyster House. We thought at first, "What a coincidence it has our daughter's name!" until we found out the whole bay is called Elliot's Bay. That's ok...the food was still great! Before calling it a day we took one of the most touristy things you can probably do, which is a harbor cruise. Even though we had seen most of the bay from up high in the Space Needle, it was still kind of cool to get a different angle on everything! ...although once the meal was over she was hard to impress. Part of the harbor we probably would never have checked out on our own was the industrial side. While not very pretty it was actually interesting all of the stuff they pack and ship out to Alaska. The red boat in the picture below is one of those that goes up to the oceans around Alaska and breaks up the ice for crabbing boats and whatnot. Kind of cool if you've ever seen "Deadliest Catch." Supposedly you must see Pike's Place Market when you go to Seattle. While we could see the charm if you actually lived nearby and wanted fresh foods, there was not much to do if you were just hanging around. However, we did meet some interesting characters, (if you click on the picture you can read the sign above the fish...kinda funny). After walking through the stalls and buying a few tastey snacks, we decided to call good enough done and head back to Portland before any of us got too "crabby." I see you went to the Pacific Northwest and got crabs...real smooth!! I can't believe how much your little girl has changed. Gives me much hope for my little dude. That looks like so much fun! You guys are cute parents. I love it.